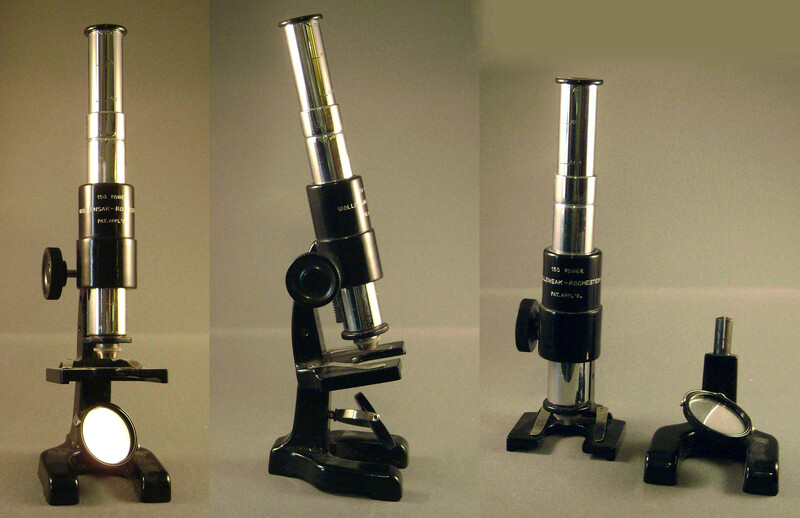 This collection contains several examples of Wollensak microscopes. The compound instruments are quite sturdy and heavy for their size. 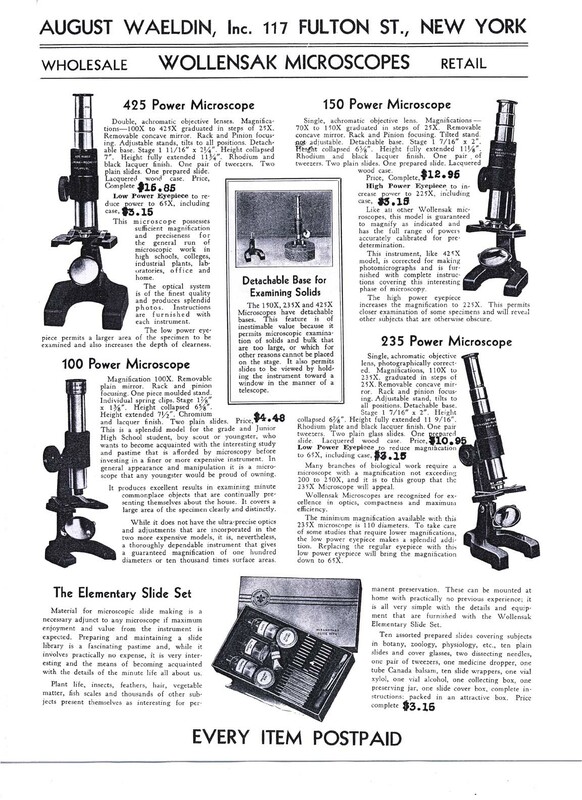 It is clear these were moderate-quality microscopes for amateurs and children, and were meant to compete with similarly priced microscopes produced by rival companies at the same time including Bausch & Lomb. They range from a simple "50 power" microscope to a compound "450 power." Entire outfits including the microscope were sold as the 'Bio-Set' by the New York Biological Supply Co. as well. The compound microscopes include models with only push-focus, as well as those with rack and pinion focus. Some are not inclining, others do incline. The compound instruments are achromatic, and most were, according to advertisements, 'corrected for photography'. Interesting features included a hole on the limb to accomodate the substage mirror to allow illumination of opaque objects, and the fact that the upper part of the microscope could detach at the level of the bottom of the stage to allow the microscope to be placed on a stationary larger object. The latter feature was seen only in the later horseshoe-footed microscopes of 150 power and above but only in the models with rack and pinion focusing. The knob driving the rack and pinion focusing mechanism was made of a plastic-like material on all models except for the 350X which had a metal knob. The round-footed microscopes do not separate at the stage, although some of them do incline. There were at least two different sized horseshoe-footed 425X microscopes. Although the 'Bio-Scope' sold with the 'Bio-Set' has an inclination joint, and is 250 power, it does not separate at the stage level from the foot, has push-pull focusing and the optical tube has a brass finish unlike the others that have a steel finish, or on later models, rhodium plating and in some cases chromium plating. Rhodium plating predated chromium plating which was impractical until the middle of the 1920's, so the claim they were rhodium-plated is probably correct. Ironically, rhodium metal is now one of the most valuable metals on earth, at times bringing up to $10,000 per ounce! Variable magnification was afforded on these instruments by divisible objectives and/or draw-tubes. The earlier ones have push-on divisible objectives, while the later ones have a screw-on divisible objective. Another way magnification could be varied was by the purchase of a special high-powered or low-powered eyepiece which took the place of the standard eyepieces; this is a rare accessory. 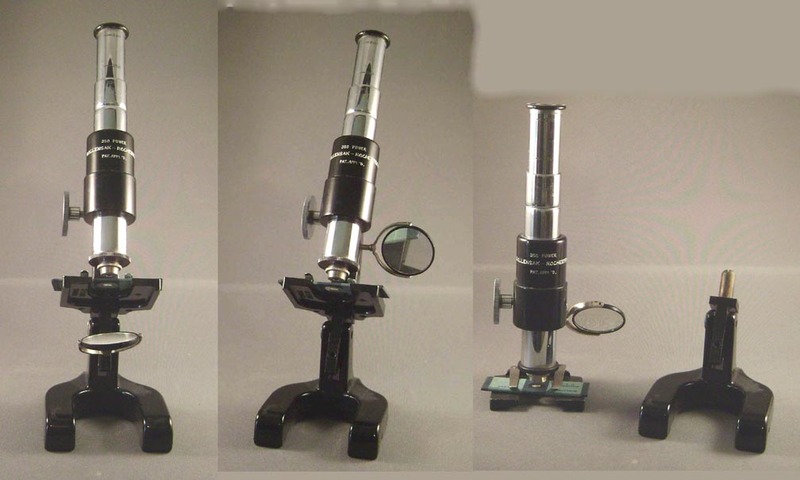 Curiously, certain microscopes came standard with a high power eyepiece with the low power one offered as an accessory, and others came with a low powered eyepiece with the high power one offered separately. This collection also contains dissecting tools, slides, slide-making items, and both advertisements and brochures, as well as other small telescopes and binoculars made by Wollensak. There are also some instruction pamphlets and short catalogs. Unfortunately there are no copyright dates on any of these microscopes or the written material. Dates were arrived at by reviewing magazine ads from the times and in a few cases, were confirmed by dates placed on the boxes or the instruction manuals by the previous owners. For the sake of continuity, this is one of the few pages on this website which mixes a simple microscope with compound instruments, since they came from the same manufactory and from the same time period. Not all Wollensak microscopes are signed, but most are. 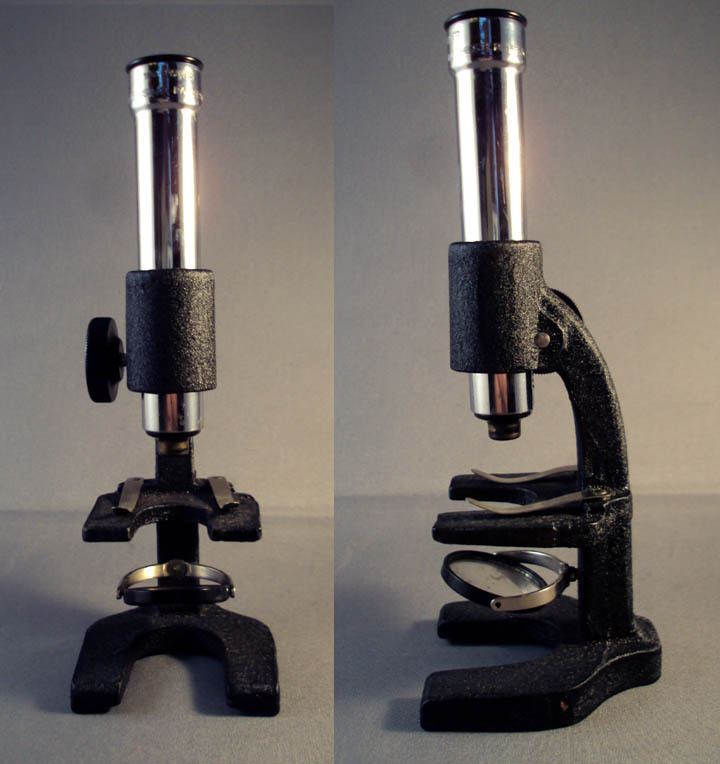 50 X SIMPLE MICROSCOPE: This is a twentieth century simple microscope simply called the '50 X.' 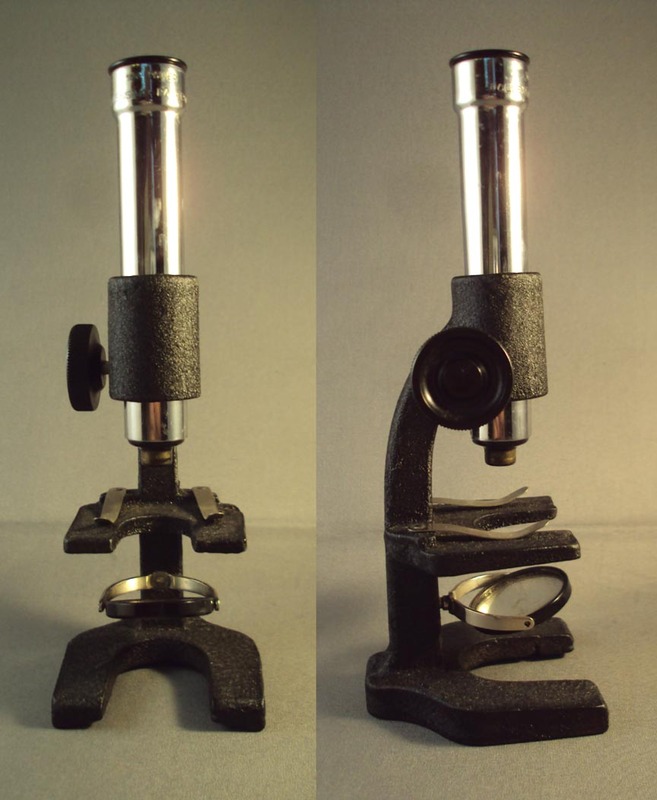 Despite being from c. 1930, it resembles the Craig microscope form from the 1800's; unlike the Craig though, the lens of this instrument does not rest directly on the specimen, and is focusable. It came in either a red and black box, or a green box, and was accompanied by a dissecting needle, tweezers, and a few slides, and blank slide labels. Two models are known; they differ in the location of the slit in the body which allows the tight fit of the eyepiece, allowing focusing. This one has a slit only part-way down the side. The other model, which may be earlier, had the slit all the way down the front. 100 POWER ROUND-FOOTED COMPOUND MICROSCOPE (c. 1927-8): This is the smallest of the compound Wollensak microscopes, one of the "100 X" or 100 power models. It had simple push-pull focusing, although a knurled part of the tube at the top makes small adjustments easier. An additional eyepiece was available to increase the power, sold separately.The stage clip is a single piece of metal in the shape of a ring. This model is uncommon. It is signed on the upper part of the sleeve: '100 POWER, WOLLENSAK-ROCHESTER, PAT. APPL'D.' It sold for $8.50 in 1927-28 according to the ad shown here and the other one shown below with the 250 power microscope. It came in a cardboard box. The patent it refers to is unknown. There was no patent granted for this model or any of its features to my knowledge. 100 POWER HORSESHOE-FOOTED COMPOUND MICROSCOPE: The next size is the larger version of '100 power' with rack and pinion focusing and nearly identical to the instrument pictured in the patent noted below. Unlike the instrument shown above this one, it has a horseshoe foot. It is signed on the optical tube near the top: 'WOLLENSAK, 100 POWER, ROCHESTER USA.' It has additional objective parts which slip on to the end of the optical tube to change power. This feature is not mentioned in the patent. Unlike the higher power rack and pinion-focused examples shown below, this microscope does not have the capacity to detach from the foot. Its price of about $4.50 would be about $60 in 2012. 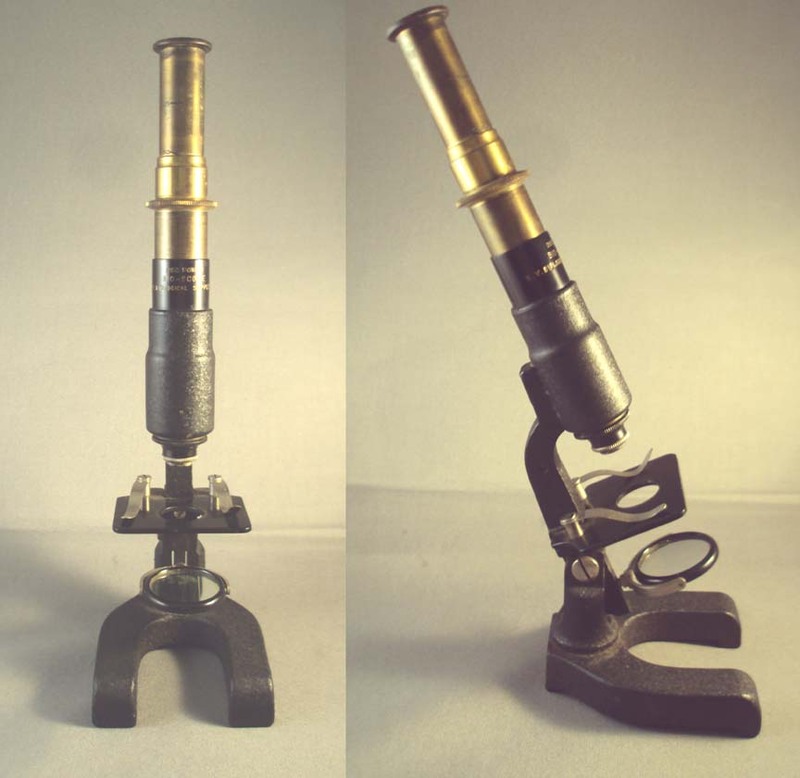 150 POWER (c. 1930): This is part of the series of microscopes as shown below with similar features except for their maximum magnifying power. 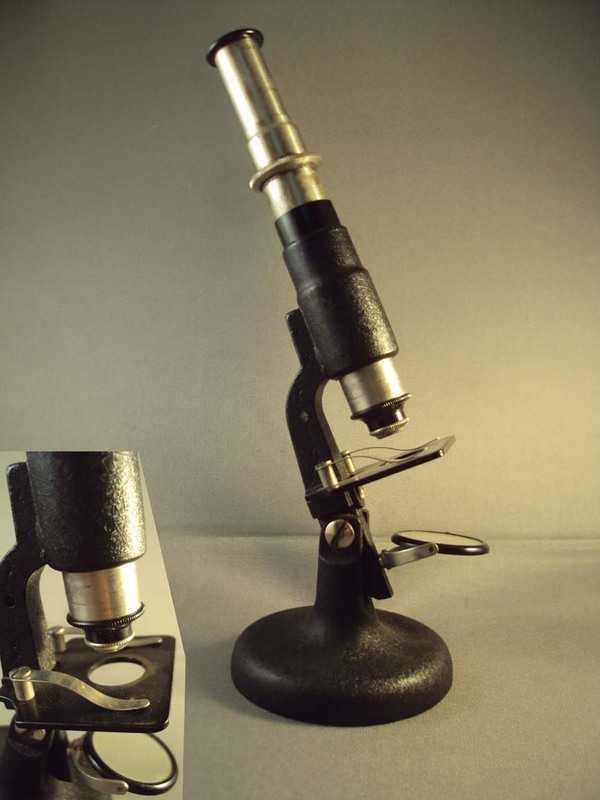 This microscope had the typical Wollensak features including, draw tube variable magnification, divisible objective, changeable eyepiece, inclination joint, ability to view opaque objects with the mirror moved to the limb, and the ability to separate the microscope at the level of the stage to place it directly on a large opaque object. The draw tube has calibrations for variable magnifications, one set of scales labelled 'single objective' and the other labelled 'double objective'. 250 POWER HORSESHOE-FOOTED COMPOUND MICROSCOPE 'BIO-SCOPE' (c 1927): This '250 power' microscope was supplied with the 'Bio-set' and focusing was again push-pull. It is one of the few Wollensak Micrscopes with a model name. It was sold with the 'Bio-Set' by the 'New York Biological Supply Co' based in New York city. It is signed:'250 POWER, BIO-SCOPE, N.Y. BIOLOGOGICAL SUPPLY CO.' It has an inclination joint and provision for attaching the mirror to the limb, allowing above-the-stage illumination of opaque objects. A round-footed version was also produced for the Bio-set. The 'bio-scopes' used a brass tube instead of a chrome-color finish, along with the black 'crackle' finish. Accompanying it in the Bio-set is a pamphlet: 'How to Use THE WOLLENSAK MICROSCOPE 250 POWER Distributed With THE BIO-SET.' It has a divisible objective, and push-pull focusing with 2 stage clips and the provision of being able to relocate the mirror on the limb for opaque illumination. The back page of the pamphlet lists the address of the New York Biological Supply Co. at 34 Union Square, New York, N.Y. The home-made slides in the accompanying set are dated 1927 and 1928. 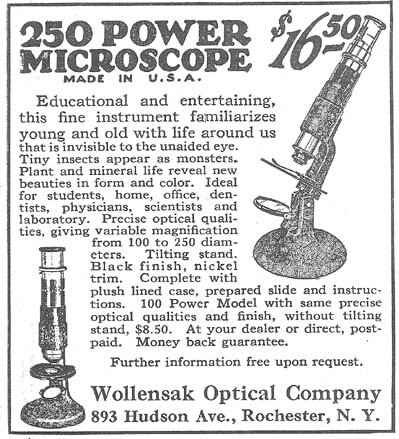 250 POWER ROUND-FOOTED COMPOUND MICROSCOPE (c. 1927-8): The next instrument is the '250 power' with round foot and which does not have the Wollensak signature, but is advertised as seen in the accompanying advertisement from 1927 (and the same ad was used in 1928), when it sold for $16.50. The optical tube has a draw tube which is graduated for different magnifications up to 250X. It is signed 'single objective' next to one set of graduations, and 'double objective' next to the other graduations for use of one or both elements achieving the lower or higher powers respectively. Although this microscope does not have the capacity to detach from the foot, it does have an inclination joint and divisible objective. It also allows the mirror to be attached to the limb for downward illumination of opaque objects. Again it has the round foot like the small 100X model above. The ad states it measures 7 3/4inches high and the base is 3 inches in diameter. The same ad mentions the 100 power without capacity for inclination with 2 1/4 inch base and height of 5 + inches. 250 POWER ROUND-FOOTED COMPOUND MICROSCOPE (c. 1927-8): This microscope is identical to the preceding example, except instead of stage clips it has a single piece of metal for supporting the slide. Instead of attaching to the stage like stage clips, the U-shaped piece is attached to the limb by a screw. 350 POWER: This microscope also had the typical Wollensak features including, draw tube variable magnification, divisible objective, changeable eyepiece, inclination joint, ability to view opaque objects with the mirror moved to the limb, and the ability to separate the microscope at the level of the stage to place it directly on a large opaque object. The draw tube has calibrations for variable magnifications, one set of scales labelled 'single objective' and the other labelled 'double objective'. '425 Power Microscope'(c 1935): According to the August Waeldin catalog, this microscope was supplied with a double achromatic objective, and has a height of 7 inches fully collapsed and 11 3/4 inches fully extended with the drawtubes. It was finished in a 'rhodium and black lacquer finish.' It was supplied with two plain slides, one prepared slide, in a lacquered wooden case for $15.85; a supplemental low power eyepiece was available for $3.15. 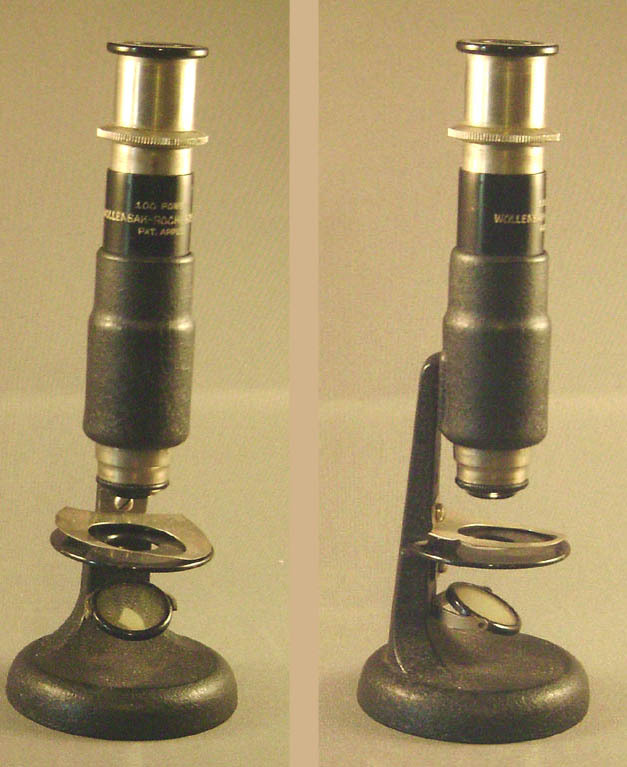 This microscope had the typical Wollensak features including, draw tube variable magnification, divisible objective, changeable eyepiece, inclination joint, ability to view opaque objects with the mirror moved to the limb, and the ability to separate the microscope at the level of the stage to place it directly on a large opaque object. The draw tube has calibrations for variable magnifications, one set of scales labelled 'single objective' and the other labelled 'double objective'. 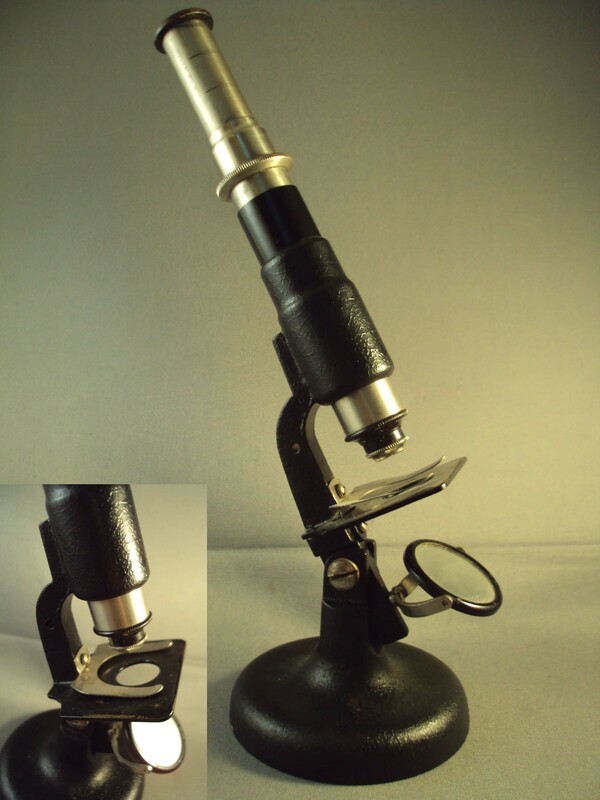 The price of this microscope at nearly $16 would be the equivalent of about $250 in the year 2012. This was not a cheap microscope by any means. 425 Power Microscope (adapted as a polarizing microscope): This instrument is identical to the other 425 power instrument listed above this one, except that both the stage and the horseshoe foot are bigger (and heavier) and the fact that the instrument has been adapted for use as a polarizing microscope. The polarizer is fitted under the stage, and the analyzer adapted to the eyepiece. This adaptation was done in a very professional manner. It is unknown at the time of this writing if this was a one-of-a-kind or if these modifications were a variation. The wooden box has the name tag of the retailer: August Waeldin. 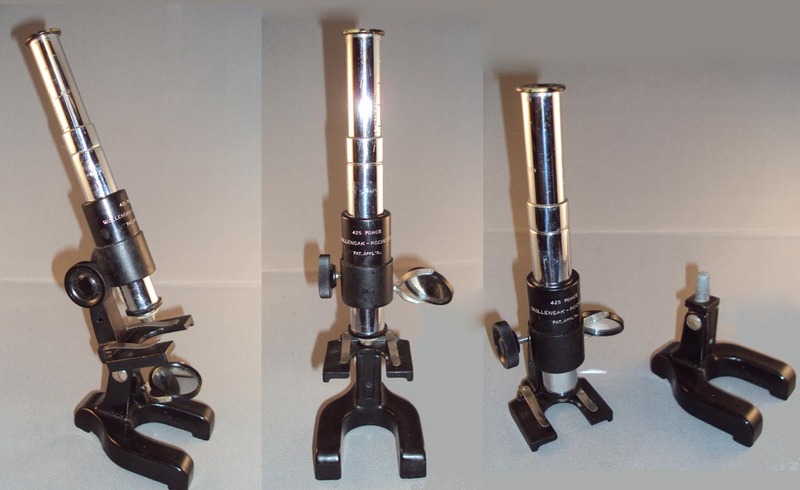 See the ad for Wollensak microscopes from Waeldin at the bottom of this Web page. Andrew Wollensak was originally a machinest working for Bausch & Lomb. In 1899 he decided to start a company of his own, specializing in photographic and optical items. The company formed in Rochester, and just like B & L, Wollensak became quite large and had up to 1200 employees. In later years, tape recorders were a big part of their business. Although this company existed for the next 70 years or so, microscopes were apparently a brief but significant part of the company's production. Almost every reference I have been able to find dates these microscopes to between about , 1927 and 1940 (mostly during the Great Depression which started in 1929, and did not end until the start of World War II). 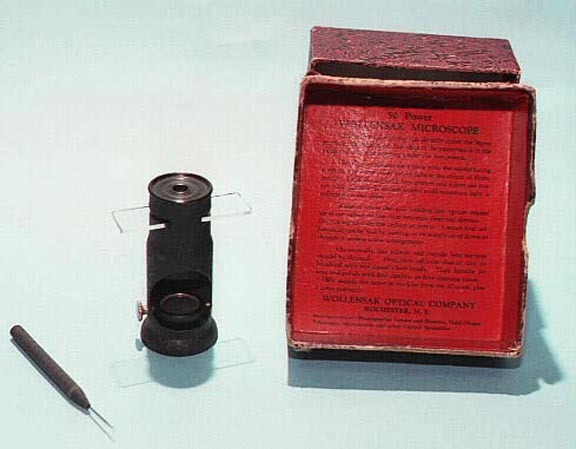 Since Wollensak supplied some optical devices to the armed forces, it may be that production of microscopes ceased at the start of production of those military items for WWII. I have found many advertisements for these microscopes but they all seem to date from the late 1925-1941 range. Several of these instruments have dates written or stamped on their accompanying literature, cases or accompanying slides, again dating between 1927 and 1941. I also have an original price list and letter from the company which is dated by the company to May 1, 1937. This 1937 price list states the prices apply to Catalog number 15 which came with the price list. 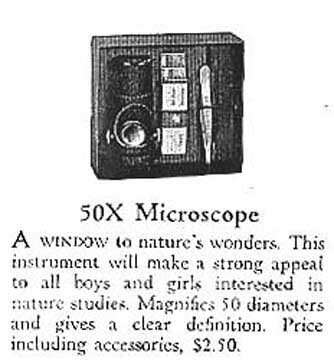 At that time the 150X microscope was $14.50, and the 450X was $20, extra eyepieces were $3.50. That is not cheap as $20 in 1937 would be about $335 in 2015. There is one patent relating to the construction of these microscopes filed by Wollensak and this is number 2,026,722 with a Patent date of Jan 7, 1936. 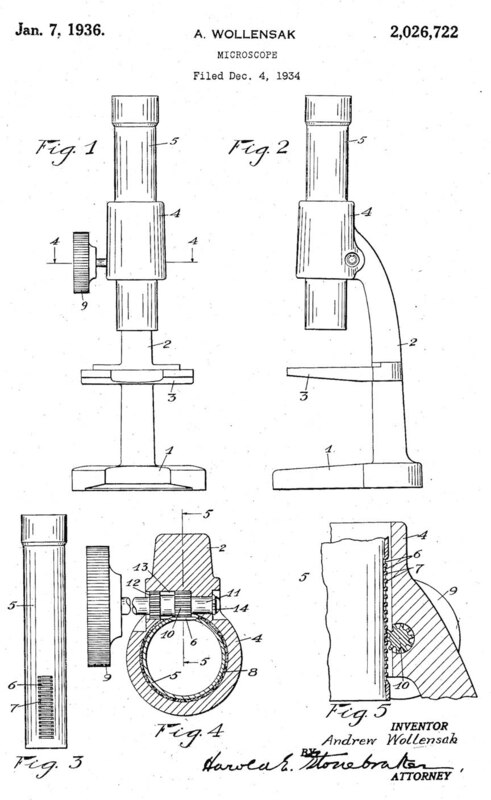 This patent refers to the rack and pinion arrangement seen on some of these microscopes which incorporates the rack as being directly cut-into the optical tube, and a simplified pinion arrangement with a knob on only one side and held in place by a split ring on the side opposite the knob. The patent does not refer to, or picture other features Wollensak included like the divisible objectives, the calibrated draw-tube variable magnification, the detachable upper portion of the microscope, etc. There is a clear difference between those from the earlier years vs later. Although there is a second microscope patent assigned to Wollensak, I can find no evidence that any microscope attributed to Wollensak incorporated it; it refers to a type of fine adjustment, which none of these instruments had. 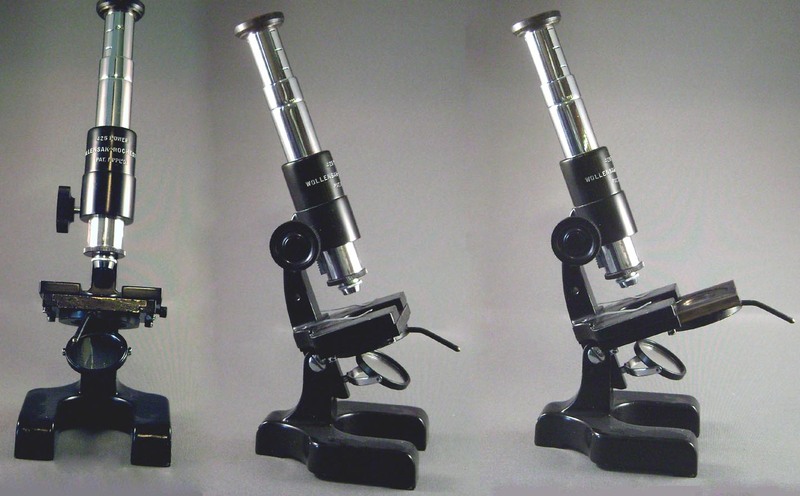 The earlier microscopes have rounded feet and a flat-black rough-surfaced finish, while the later ones have a horseshoe-shaped foot and a semi-gloss smooth black finish. As mentioned above, some of the microscopes that I have examined have dates applied by their owners, either to their case or the accompanying papers or instructions. 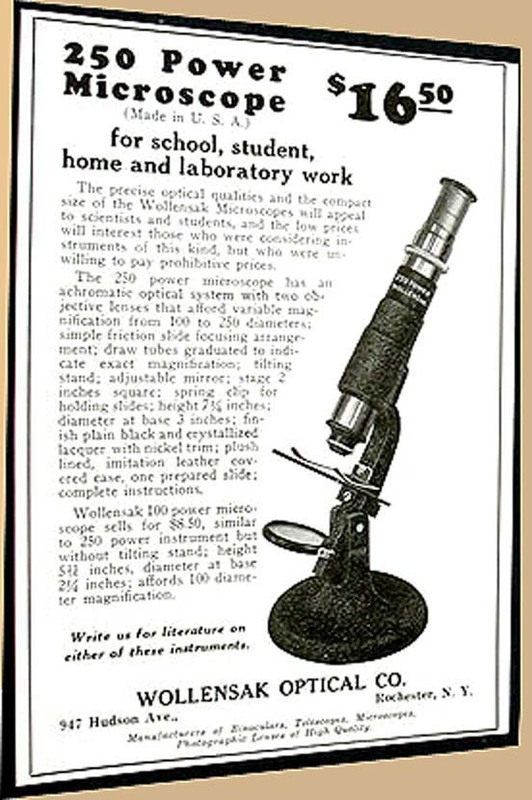 Although one might think the simple microscope by Wollensak was earlier than the compound instruments, it is evident from advertisements that it was sold at the same time as the compound instruments. Wollensak also produced small telescopes and binoculars, many frankly miniature in scope, some of which are also part of this collection. 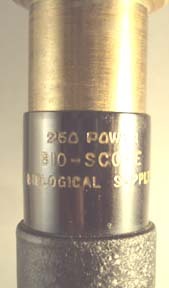 Their 250 power microscope was sold by the New York Biological Supply Co. with a 'Bio-Scope' label and the NYBS name on them as can be seen in the example above; these were sold in the same time period. New York Biological Supply supplied their own standard size slides and slide-making apparatus in these kits. Wollensak also sold slides and slide-making kits (also in the collection) but these are distinctively smaller slides. Although NYBS sold them with the NYBS name on them, August Waeldin sold them and advertised them as Wollensak Microscopes. If anyone is aware of additional dating information for these instruments I would be very greatful for the information.